KISS guitarist Paul Stanley is joining forces with fellow KISS co-founder Gene Simmons in his Rock & Brews restaurant venture as the company prepares for worldwide expansion. Together, the pair will co-host the March 22 and 23 opening of Rock & Brews in San Jose del Cabo, Mexico, the second location for the emerging brand. 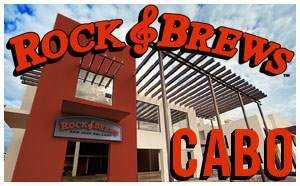 Rock & Brews Los Cabos is the first international location for the new entertainment and rock-themed dining concept. Stanley and Simmons, along with Rock & Brews co-founding partners restaurateur-hotelier Michael Zislis and veteran concert promoter Dave Furano, have teamed up with Los Cabos’ restaurateurs Jessica Moreira, Rodrigo Cabeza De Vaca, and Sergio Martinez, and developers Alfredo Gadsden, Gabriel Gadsden and Mario Gadsden for the opening. The new Rock & Brews Los Cabos features a unique concert themed-atmosphere complete with hand-painted murals of rock artists, album and tour art. Guests can take advantage of the al fresco dining offered, or enjoy sitting indoors in an authentically themed backstage concert site. The restaurant features a full bar and will have the largest selection of craft beers in Los Cabos. It is set to be a main late-night attraction for locals and tourists alike, as after the dinner rush, a DJ will be spinning tunes nightly. The grand opening of Rock & Brews Los Cabos will welcome about 400 KISS fans from around the world, along with music industry notables and local VIPs. A special KISS Army Rock & Brews package is available at the Sheraton Hacienda del Mar Golf & Spa Resort that includes a two-night stay in a deluxe room with a Jacuzzi and private terrace (double occupancy) March 22 and 23, two tickets to the invitation-only Rock & Brews opening on March 22, a private seaside reception and photo opportunity with Gene and Paul at the resort’s Five Star Diamond De Cortez restaurant prior to the opening event, a breakfast buffet for two at the resort’s Tomatoes restaurant, and a Rock & Brews t-shirt for $749, including tax, based on availability. The rate code is KISARRB. For more information or to make reservations, visit www.sheratonloscabos.com or call (011) 52-624-145-8000. Four additional Rock & Brews restaurants are currently in development. Rock & Brews Redondo Beach (on Pacific Coast Highway) is set to open in late April; Rock & Brews LAX (in the Delta Airlines Terminal) and Rock & Brews Paia, Maui will open this summer; and a Rock & Brews Prairiefire, in Kansas City, MO is also slated to open later this year. Several others are on the drawing board for locations throughout the United States and abroad. Rock & Brews Los Cabos is located at Paseo Malecón San José Plaza del Pescador Local 1, San José Del Cabo. For more information, visit www.rockandbrews.com.